Himalayan Persian cats - what's in a name? Nicknamed the 'Himmy', this cat must have the most names of any breed around! Himalayan Persian cats are also known as Persian Himalayan cats, Colorpoint or Colourpoint Persian, Colorpoint or Colourpoint Longhair, Himalayan Siamese, and even, sometimes, Longhair Siamese! What they're called depends to a certain extent on which association they're registered with. The term Himalayan is most commonly used in the United States, and is taken from the Himalayan factor gene (it's also seen in rabbits) which produces the point pattern found in these cats as well as in the Siamese breed. 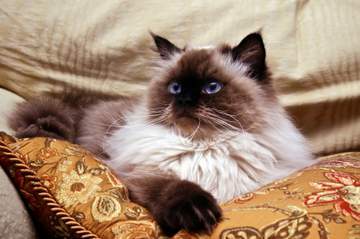 What does a Himalayan cat look like? Himmies were created by crossing Persian and Siamese cats. 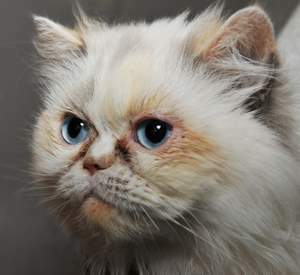 As you can see from the Himalayan cat pictures on this page, this gave them the thick coat of the Persian with the colorpoint markings of the Siamese. These are medium to large-sized cats, and their body and facial shape is more like the stocky Persian type than the longer, slimmer Siamese. 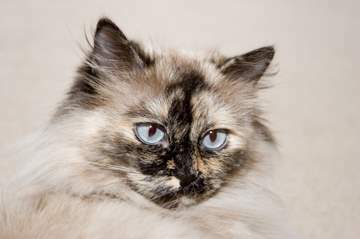 Persian/Siamese crosses were first seen in the 1920s, but it wasn't until the 1950s that breeders were really able to produce the coat and colors they wanted. Himmies were first recognized in 1955 by the Governing Council of the Cat Fancy in the UK, which gave them the name Colourpoint Longhair. By the 1960s, most of the American registries had also accepted the breed, but used the US spelling of the name, Colorpoint Longhair. Himalayans can be found in most of the colorpoints. Seal, blue, chocolate, lilac, red (flame) and cream, as well as tortie and tabby (lynx). The pictures of Himalayan cats I've included here show several of these. With their long, full Persian-style coats, Himalayan Persian cats obviously need regular brushing and combing to keep them in top condition. Make sure you brush between their legs, under their tails and particularly their neck ruffs to stop their coats from matting and remove any fur matts that might have accumulated. Sponge their faces and eyes daily with a warm, damp facecloth or cotton ball. Some Himalayan cat breeders also recommend regular bathing. Himmies are, like Siamese, generally healthy, although their Persian genes can sometimes cause Polycystic Kidney Disease. They are medium to large cats (the average weight of a Himalayan is around 7-12 lb). They are intelligent, good-natured and sociable, and (again because of their Siamese ancestry) tend to be more active than the average Persian. If you'd like to learn more about Himmies, a book that's had a number of good reviews is J. Anne Helgren's Himalayan Cats , which is a guide to owning and caring for this long-haired breed. Another book (this time, a novel) I love is David Michie's 'The Dalai Lama's Cat' about a Himalayan cat rescued by the Dalai Lama as a small kitten. The story tells of her life in Dharamsala and the comings and goings of the people who surround the Dalai Lama. It's a joyful, gentle, loving book - just purrfect for anyone who loves Himmies! Ragdolls or Birmans, these are separate and distinct breeds.